Galway supporters lucky enough to have been in Croke Park on Sunday afternoon witnessed history being made with the county winning its fifth senior All-Ireland hurling title - their first since 1988 when Conor Hayes led the team to All-Ireland glory. Twenty-nine years later David Burke was the captain leading his county to All-Ireland glory - an outstanding captain too - for a team that claimed the Liam MacCarthy Cup with a show of top-quality middle to longrange shooting to which Derek McGrath’s Waterford had no answer. Amazingly Micheál Donoghue’s team for a fourth consecutive game did not raise a green flag. No goal in almost 300 minutes of consecutive championship action is rare, but it did not matter a jot to the outcome as Galway came home on a scoreline of 0-26 to Waterford’s 2-17. 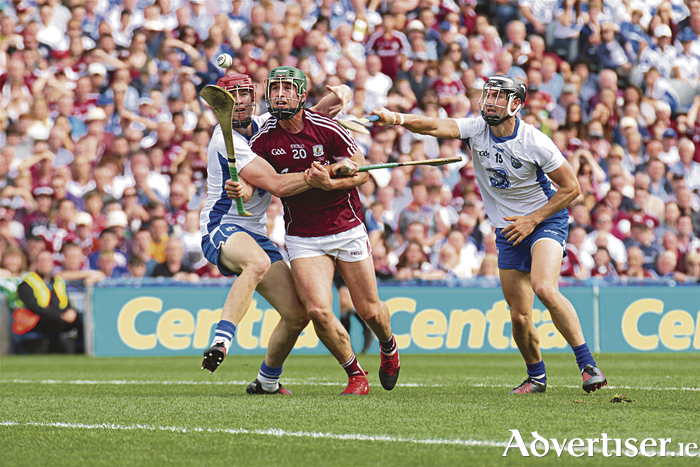 The Galway players showed great patience and self-belief as they picked away at their points. They never felt the need to start ploughing down the middle looking for goals, even when they coughed up two handy enough ones to Waterford. The belief was there to stick to the plan with the expectation that it would see them home, and it did. Galway supporters were understandably ecstatic after the final whistle and why wouldn’t they be after a litany of All-Ireland final defeats since 1988? Defeats to Kilkenny in 2012 and 2015 were still fresh in supporters’ minds and still raw enough for players involved in those games. This team has such an array of shooters from distance that they can win games without resorting to goals. They shot 0-33 against Offaly, 0-29 in the Leinster final, and 0-22 to see off Tipp in the semi-final, so they are consistently good in the point-taking tables. Players such as Conor Cooney, David Burke, Joseph Cooney, Conor Whelan, Johnny Coen, Padraig Mannion and Joe Canning have all hit points from distance with regularity, and when the need was most last weekend, substitutes Jason Flynn and Niall Burke also came on board to steer the Liam McCarthy ship into harbour with two points each. Galway started like lightning on Sunday and six maroon players had all fired over points in the first eight minutes. They were to go another eight before they had any wide, which shows top-class decision making as well as accuracy when needed. Waterford looked in deep trouble early on, like a team that could be overwhelmed until Kevin Moran beat Colm Callanan on his near side after five minutes. Team captain David Burke stroked over his second point after 20 minutes to make it 0-10 to 1-4 and Galway were moving smoothly. However, Waterford were thrown a lifeline with Kieran Bennett’s freak goal which Colm Callanan will be infuriated to have let in. It was a soft goal to concede and it put Waterford, who were leaking for a lot of the half, on level terms. Galway needed something to settle them a bit and unsurprisingly it was Joe Canning who provided the tonic with a sweet side-line cut. Despite having been the dominant team in many positions, and having outscored Waterford by 14 scores to nine, Galway only led by a single point, 0-14 to 2-7 at half-time, resulting in many nervous Galway supporters who were far from happy with the concession of the two goals. Waterford did go ahead in the second half, but Niall Burke’s power and ball winning ability made a difference on his introduction and he won a scorable free on his arrival. At 2-12 to 0-17, it was Waterford who looked to be getting into their stride a bit. Niall Burke squared things up once more and then added his second a minute later to nose Galway in front. Adrian Tuohey caught the ball three times at one stage when he was in a good position coming out of defence, and another one came from John Hanbury picking the ball off the ground when he had time to lift it properly. Despite those frees that kept Waterford on Galway’s coat tails and a few late skirmishes by Waterford looking for a potentially match-levelling goal, the Galway rearguard, led by Daithí Burke, Tuohey, Hanbury and Gearoid McInerney, held firm and kept their goal intact in the last 10 minutes. It seems approriate that it fell to Joe Canning to take Galway’s last belt of a ball in the last minute from a side-line cut before Fergal Horgan called time and Galway were once again All-Ireland senior hurling champions. Scorers: Galway: Joe Canning 0-9 (6f, 1 sideline ), David Burke 0-4, Conor Cooney 0-3, Cathal Mannion 0-2, Joseph Cooney 0-2, Niall Burke 0-2, Jason Flynn 0-2, Conor Whelan 0-1, Johnny Coen 0-1. Waterford: Pauric Mahony 0-11 (8f ), Kevin Moran 1-1, Philip Mahony 1-0, Jamie Barron 0-2, Michael Walsh 0-1, Brian O’Halloran 0-1, Tommy Ryan 0-1. Ref: Fergal Horgan (Tipperary ).